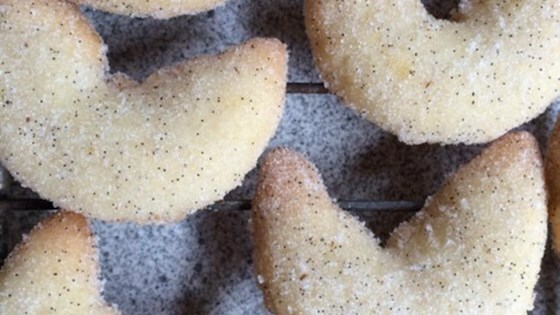 "Vanilla cookie crescents make the perfect German Christmas treat." Stir all-purpose flour, almond flour, and 1/2 cup plus 2 tablespoons white sugar together in a bowl. Add 1 cup plus 2 tablespoons butter and egg yolks; knead in bowl with your hands until a smooth dough forms. Divide dough into quarters and form each piece into a rectangle. Wrap each rectangle in plastic wrap. Chill dough in the refrigerator until firm, at least 1 hour or overnight. Place 1/2 cup plus 1 tablespoon white sugar in a food processor. Cut each vanilla bean in half lengthwise and scrape seeds from each half with the back of the knife; add to sugar. Pulse until seeds are evenly dispersed. Pour vanilla sugar into a shallow bowl. Cut 1 dough rectangle into 6 equal pieces, keeping remaining dough chilled. Roll each piece evenly into a 1/2-inch-thick log on a lightly floured surface. Cut each log crosswise into 2-inch pieces and gently roll or pinch ends of each piece into points. Curve each piece into a crescent and transfer to prepared baking sheet, arranging about 1-inch apart. Bake in the preheated oven until bottoms are lightly golden but tops are still pale, 10 to 12 minutes. Remove from oven and let stand 2 minutes. Roll warm cookies in the vanilla sugar, brushing off excess sugar. Transfer cookies to a wire rack to cool completely. Repeat with remaining dough, baking in batches.